After several miles of downhill hiking, I arrived at one of the falls along the Cedar Run Circuit. By this time of the day, the clouds had begun to build so the lighting was pretty low. 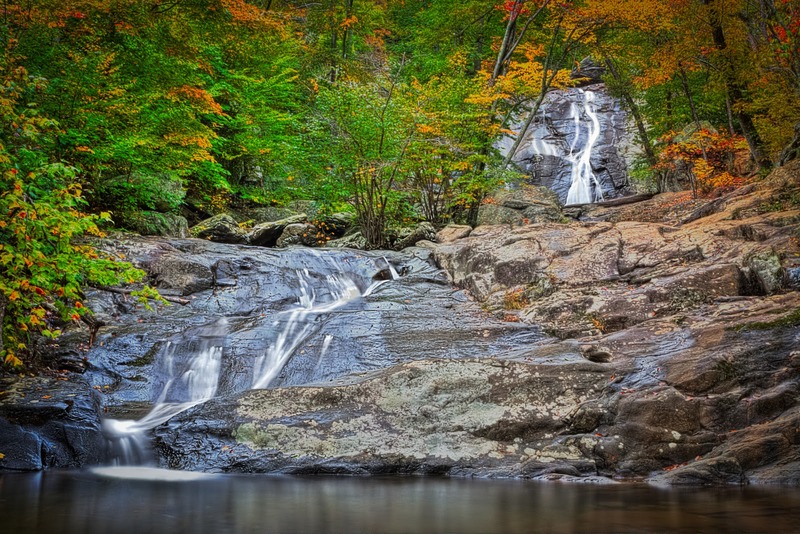 I could get an exposure of 1.3 seconds without a neutral density filter to blur the water. Even so, I attached the filter just to see what kind of difference it might make. With the filter in front of the lens the exposure jumped to 13 seconds. Although the 1.3 second exposure did just fine, the 13 second exposure was clearly better. Three shots with a 1 ev. spacing produced the HDRi. 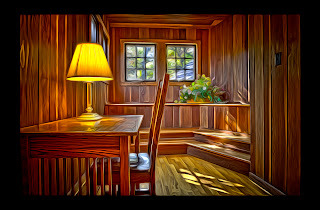 An HDR painting created from four exposures with a 2 ev. spacing. The images were merged and toned using Photoshop 5. 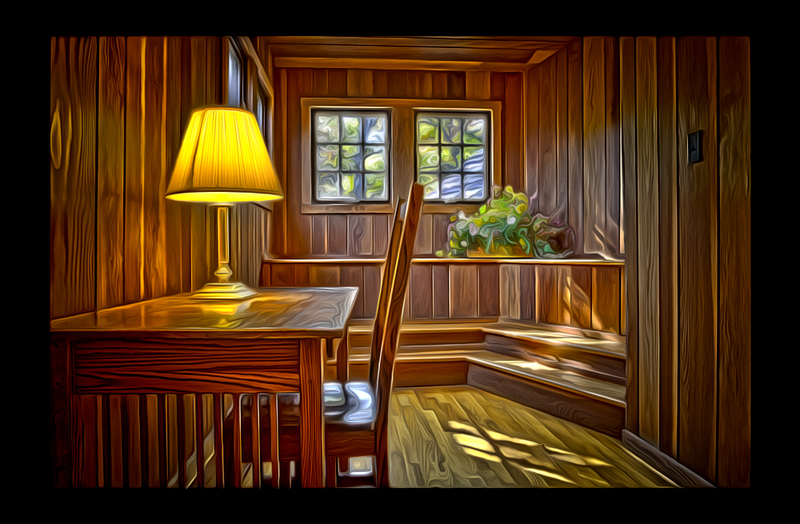 Pixel Bender created the painterly effect. 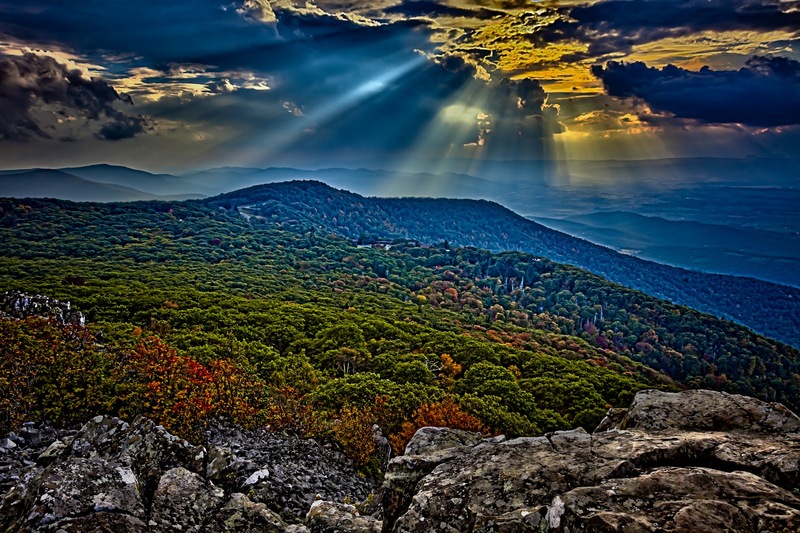 The images were captured in a hallway upstairs at the Big Meadows Lodge along Skyline Drive, Virginia. 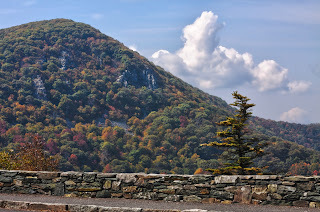 Early fall colors along Skyline Drive, Virginia, 2012. This panorama was comprised of five sets with five exposures each at 2ev. spacing. Each set was merged to HDR and toned with Photomatix Pro 4. The resulting Tiffs were stitched together inside Photoshop's Photomerge. Final touches added using Lightroom 3. 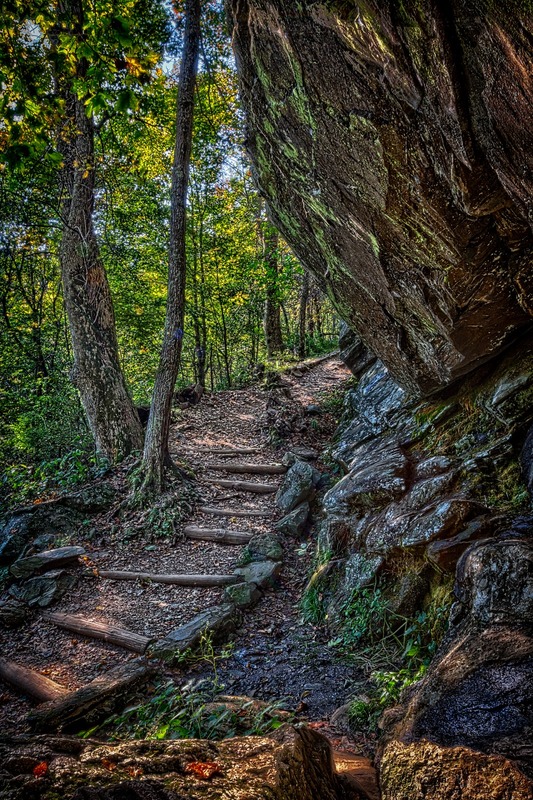 The hike to Little Stony Man is a breeze compared to some other trails. 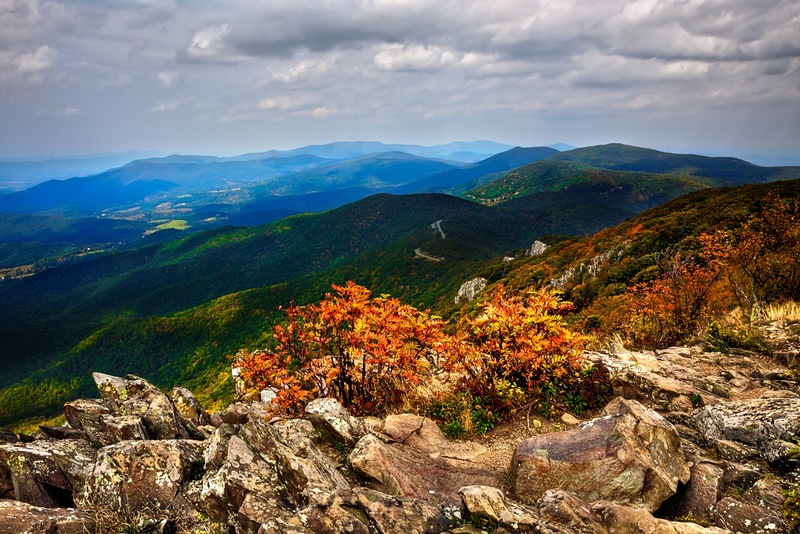 At just under a mile there and back, along relatively gentle slopes, this trek features some of the most spectacular views in the entire park. 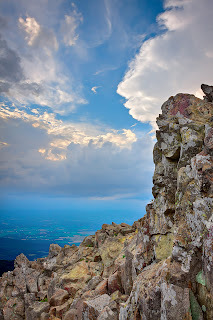 This image was created from seven exposures at 1ev. spacing, processed with Photomatix and Photoshop. 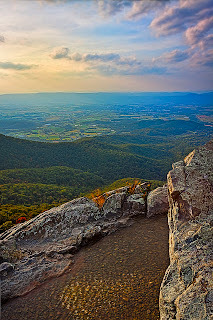 Rolling Hills of the Shenandoah Mountains as viewed from Stony Man in Skyland, Virginia. 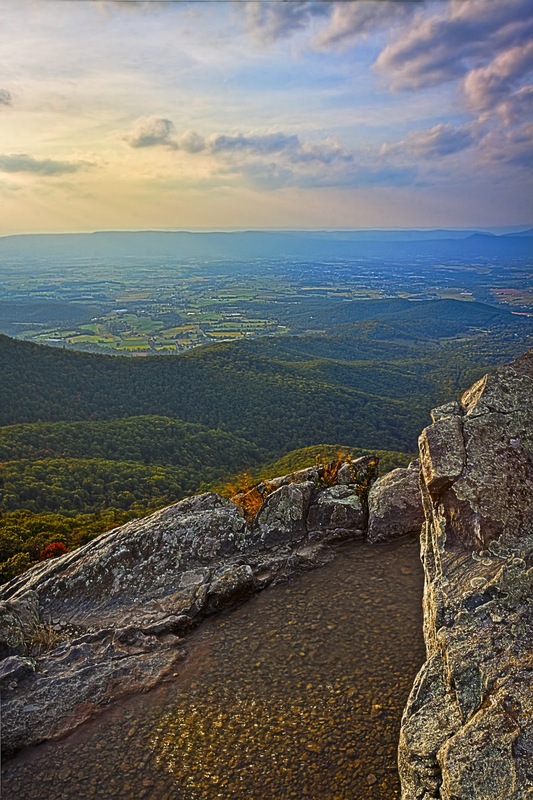 A view along Skyline Drive, Virginia. 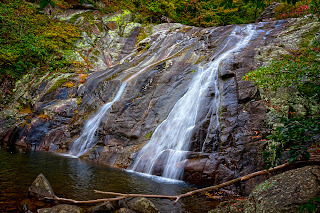 I had no intention of hiking all the way to the White Oak Falls when I started out from the Hawksbill parking area along Skyline Drive. 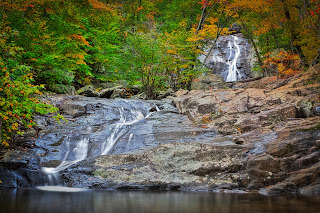 I figured I'd hike as long as the Cedar Run Falls and then make my way back. Once I arrived at Cedar Run, the water flow was a bit disappointing. I wasn't impressed at all so I had to decide whether or not to seek out better opportunities for a good shot. 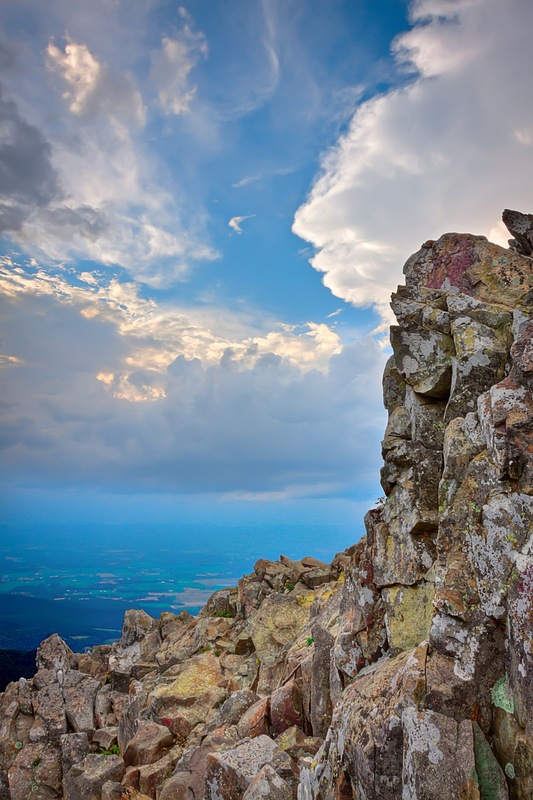 As a non-experienced hiker, it was obvious to me that there was great risk in continuing. 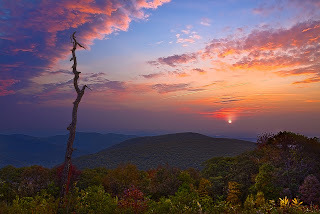 It was my last day in the Shenandoah Mountains so I just couldn't pass up the chance. With little Gator-Aid left, a few energy bars, burning thighs and a long slog ahead, I knew I'd press myself to the limit going forward. I was right. In fact, I under-estimated how challenging it would turn out. This was the most physically difficult thing I have accomplished since a forced road march thirty years ago, during the Army years. By the time I reached the valley, I was out of drink and exhausted. Half way finished and high and dry. What kind of an idiot am I, anyway? Morale seemed more bruised than body. Then came the realization that this trip was several months in planning and there was no time for remorse. The deed is done. Take pictures to ease the pain. So I did. Then a stroke of fortune happened upon me. 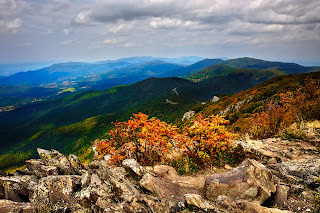 I came across a fellow hiker/photographer whom I asked for pointers on the return hike. 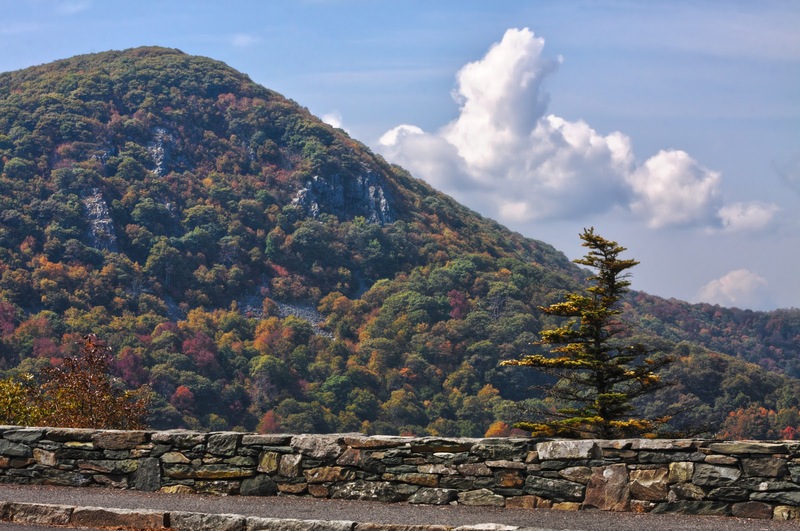 Joe was a real gentleman, fantastic photographer and experienced hiker. Joe, in his kindness, took out of his time and provision enough to share his water and knowledge, point me correctly back up hill and offer encouragement. What a great guy. If you've lost faith in your fellow American, you haven't met Joe. Eventually, I reached the lower falls and breathed a sigh of relief. I had made it, finally. Would I do it again? Yes, I would. I would do it again with a new found respect for mountains and hikers everywhere. 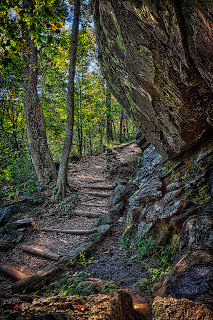 Along a very challenging 8 mile hike through the beautiful White Oak Canyon and Cedar Run, I passed great granite boulders which seemed to hang precariously over the well worn trail. 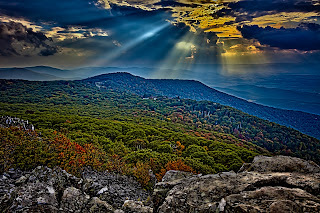 Viewed from the cliffs of Stony Man, the setting Sun bursts through storm clouds over the Blue Ridge Mountains.